Well folks, this year I broke my own rule. I have a strict policy of “No Christmas until AFTER Thanksgiving”. Even as much as I love Christmas time, I do not indulge in Peppermint Mochas nor do I listen to my vintage holiday albums until after I’ve eaten turkey. But this year, when my friend Crystal of Baby Begonia asked if I wanted to be a vendor at her Holiday Craftacular, I just couldn’t pass up the opportunity. Since I’d never really done an event like this, I wasn’t exactly sure how much to make. I wanted a variety, and I wanted to show off how tasty treats can be adorably sweet, but I also didn’t want to go home with 10 lbs. of leftover fudge on my hands, either. 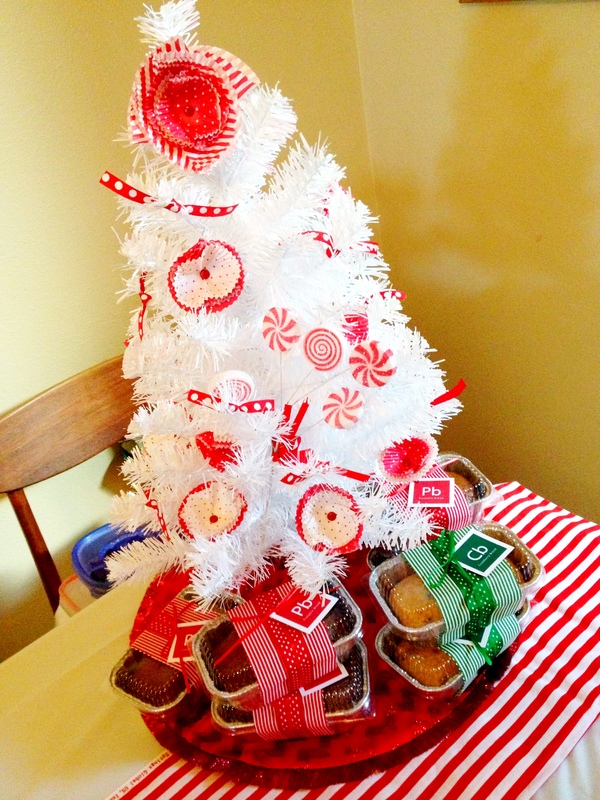 I decided to stick with some tried and true holiday favorites, and I threw in one new treat for fun. Fortunately, I guesstimated correctly; I ended up selling everything I made — hooray! But the best part was seeing all the people enjoy the stuff in person. I had a great time and I definitely want to try and do more of these “live” events in the future! Inspired by the Periodic Chart of Elements, I think of certain flavors as elements of the holidays. I usually do Gingerbread and Pumpkin Bread, but since my favorite Gingerbread recipe was more labor-intensive than I could pull off under such a time crunch, I opted for making Cranberry Orange Bread instead. These make such nice hostess gifts if you’re an invited guest for Thanksgiving dinner or even if you just don’t want to show up empty handed at the holiday party. I made some Fall themed loaves with brown hounds-tooth fabric I had, attached an orange bow, and voila – they’re ready for Thanksgiving! I also did my signature red and green stripes/polka dots loaves for Christmas. Learn to make the no-sew packaging yourself, here! Yup, you read that right This stuff is ridiculous. The part I love most is that it’s delicious and pretty. 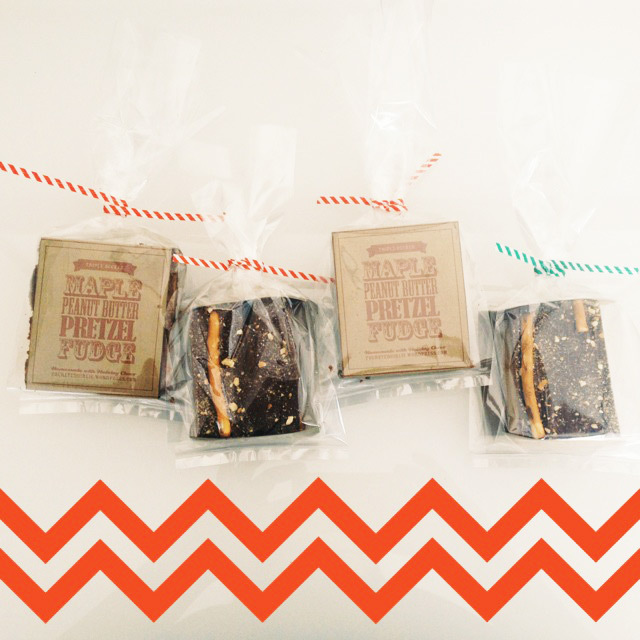 I package huge pieces of it so you can see how rustic the pretzel rods and crushed pretzels look on top, even though it’s so decadent that there’s realistically about 4 pieces per “block”. Recipe and free download for a tag is here, now go make some yourself! These are so. freaking. easy. 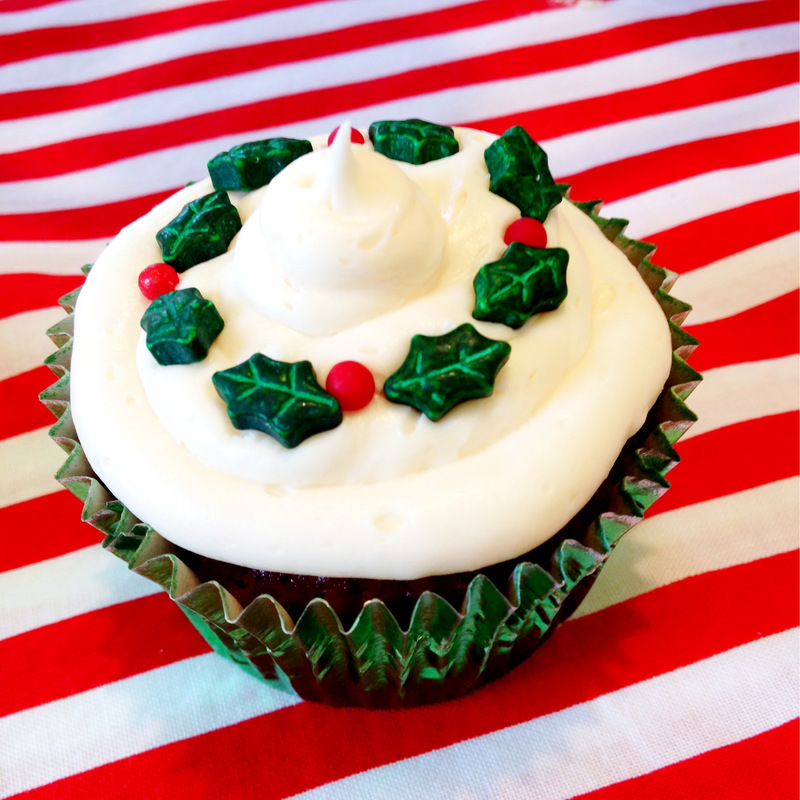 Use your favorite cupcake recipe and pick up a bottle of these Holly Mix sprinkles by Wilton. Yes, I apply the sprinkles individually with tweezers so I can make them perfect. Really, it’s that easy. #4 Red Velvet Brownies drizzled with Cream Cheese IcingThese were new for me, but I had to make them, simply because I wanted something red! This is a GREAT brownie recipe – super crackly on top, and gooey on the inside. I used a round cookie cutter to cut the brownies so they’d be a perfect fit inside these red/white striped baking cups I had. But, when I cut them, the tops were so crackly that they weren’t very pretty, so I flipped them upside down and iced the bottoms! Wish I would’ve remembered to take a pic before they were gone. Sorry ’bout it. This recipe is a keeper. Make your own using this recipe here. 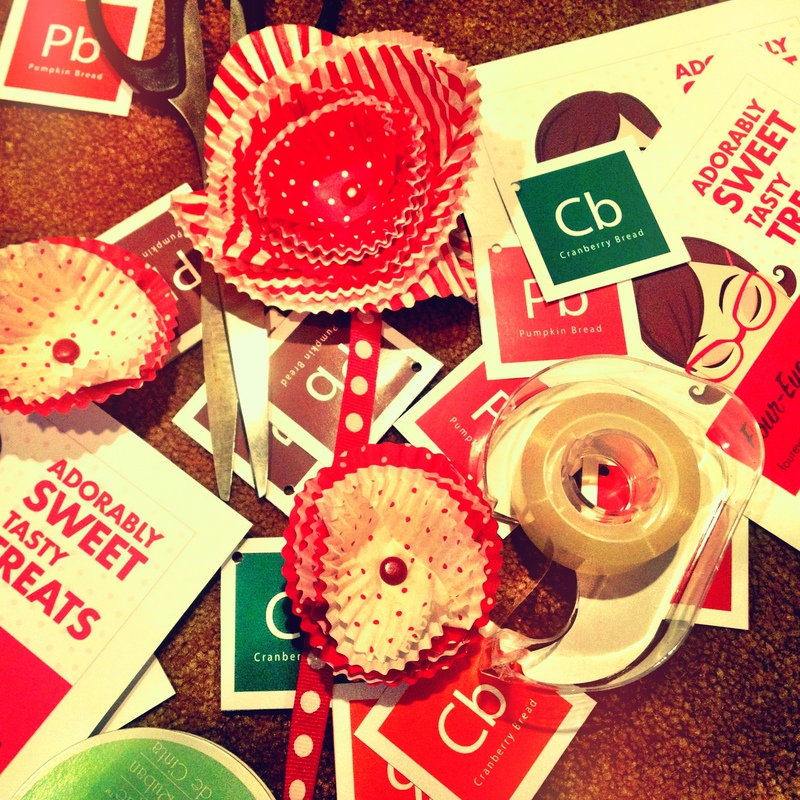 Now it’s time to take a break and gear up for more holiday treat making once the season officially begins! Still trying decide on this year’s goodies. What will you be making? 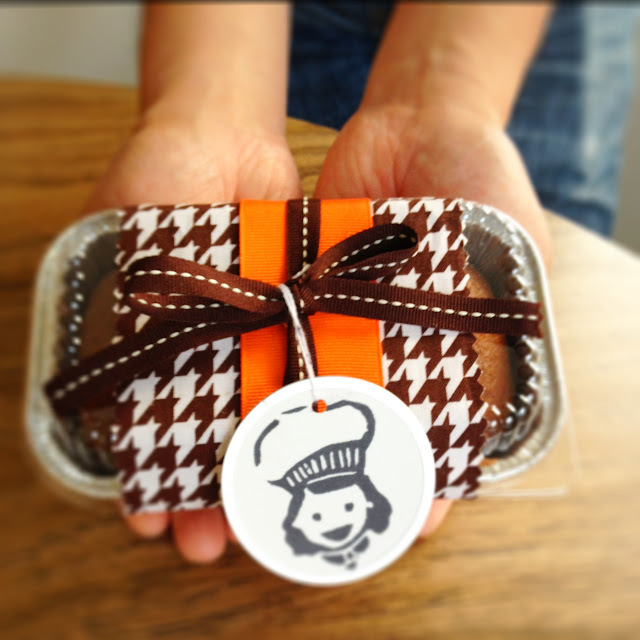 Special Treats: Surprise for Mamas! I sure am lucky to have a lot of mama friends in my life, and when new babies are born, I like to make “special” cookies, just for mamas. I found this special recipe after I had my daughter and they helped me, so I like to make them for moms who might want a little help, too. I made a batch yesterday and wanted to make a few surprise deliveries. 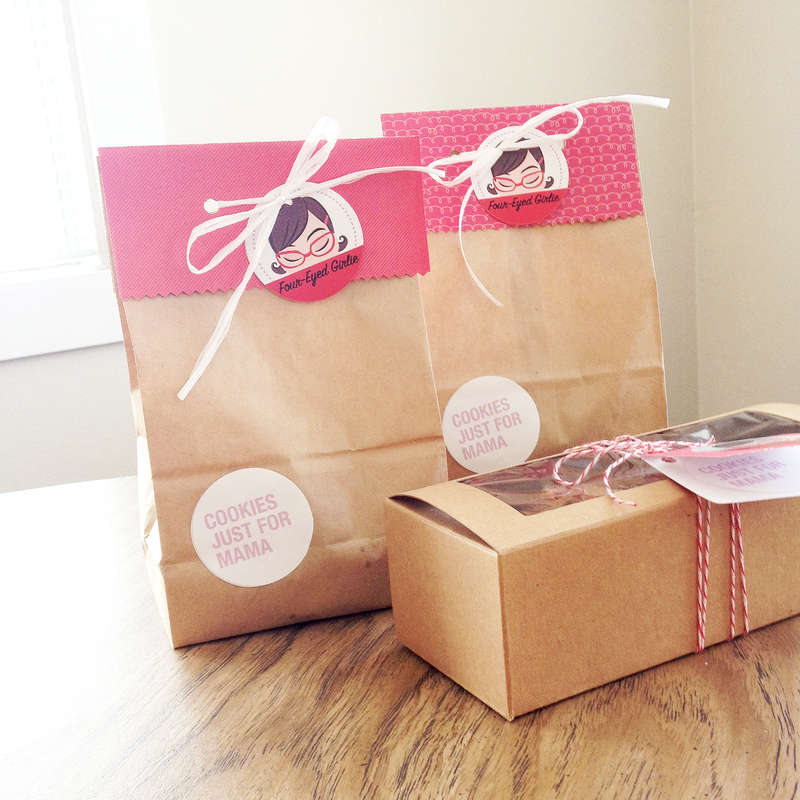 My packaging supplies are a little tapped out lately, so I threw together these bags with stuff I already had. It’s super easy, and it’s not hard to do! Simply choose whatever paper you’d like to use, cut the same width as the bag. Fold bag down, and fold paper over the bag fold. 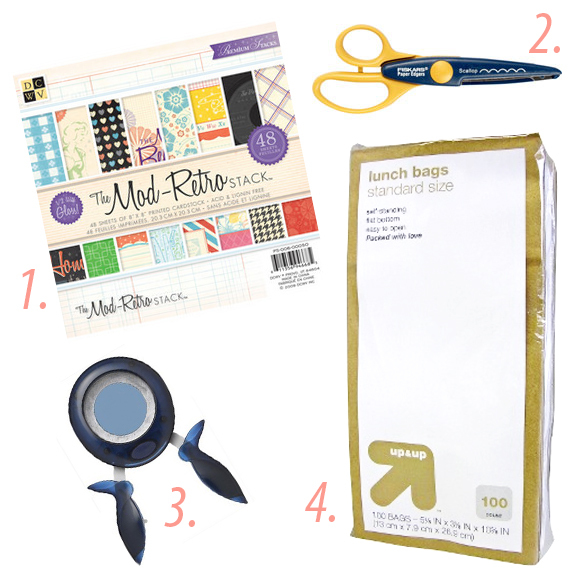 Punch holes through bag and paper and tie with ribbon or wraphia. 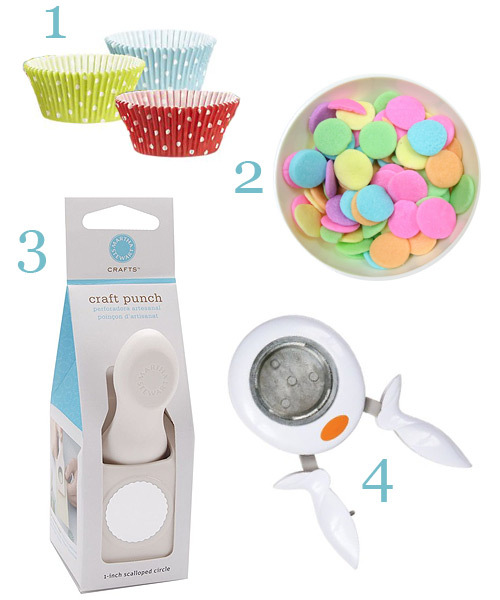 Embellish using craft punches, scalloped scissors or whatever you have on hand! If you’d like to make your own cookies for a nursing momma, check the recipe! Have fun surprising someone, too! 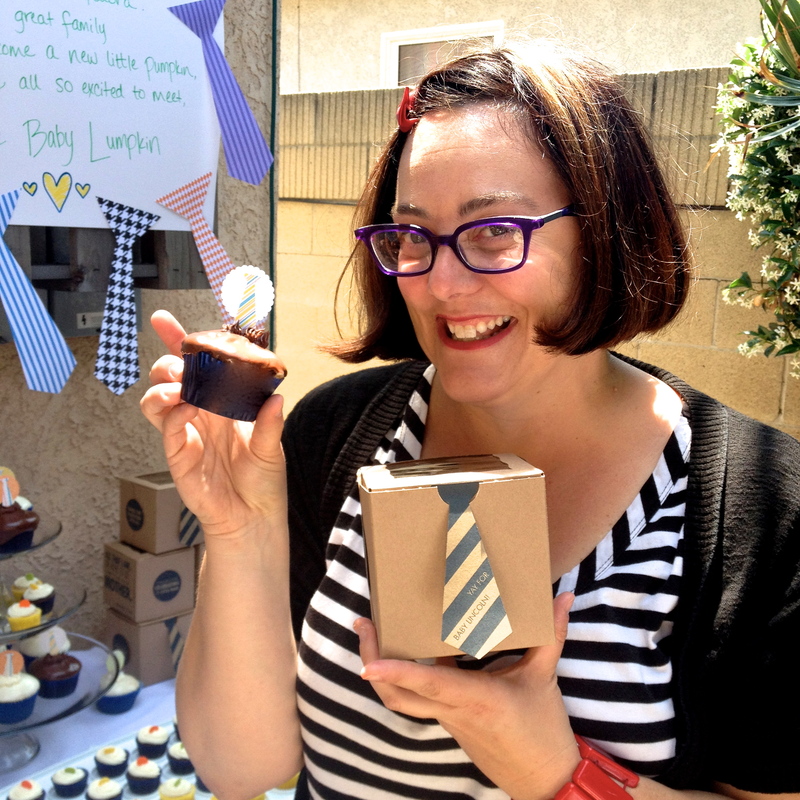 I had the privilege of making cupcakes and favor boxes for a baby shower yesterday —one of my very favorite kind of projects! 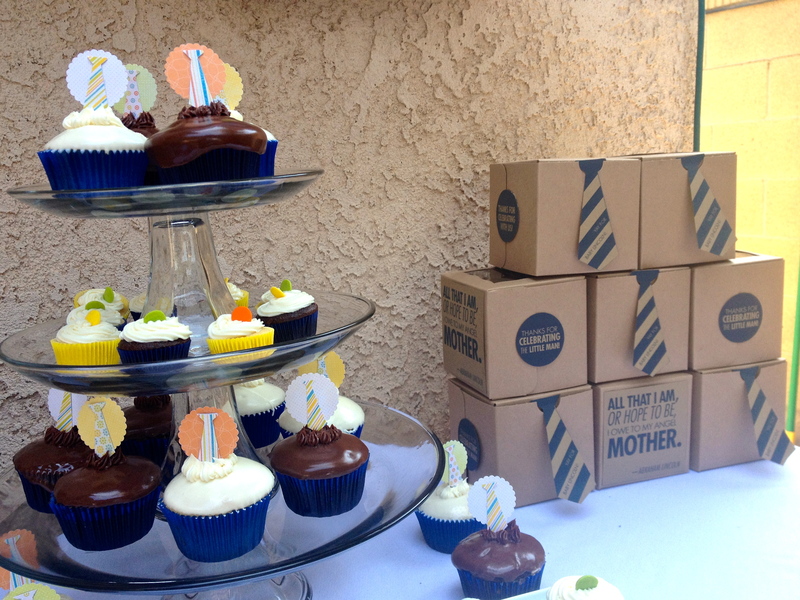 The hosts chose a “little man”/necktie theme, and wanted cupcakes for both the party and to take home as favors. 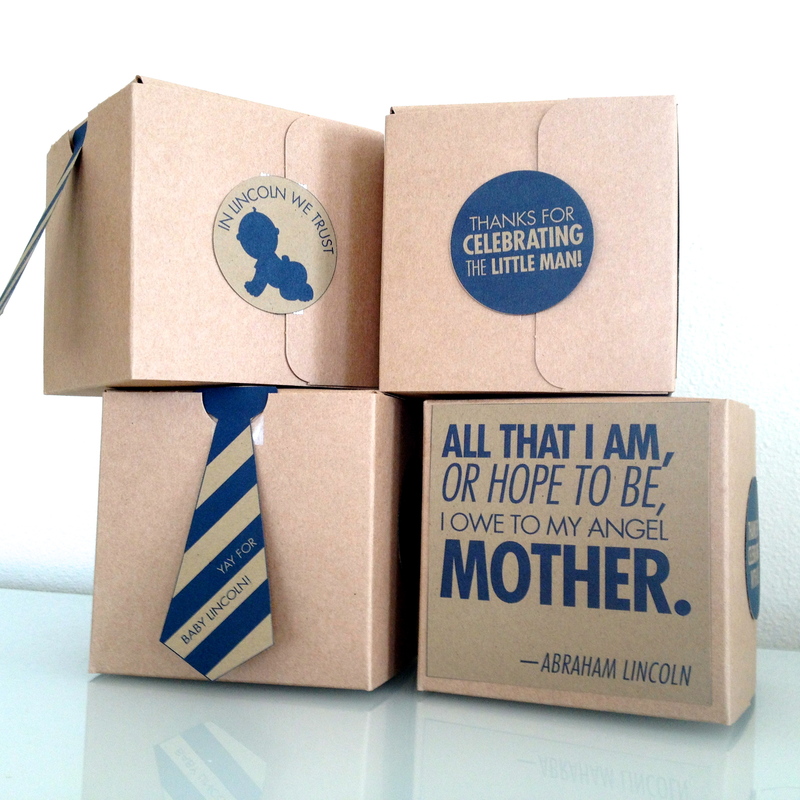 When they told me baby-to-be’s name was going to be Lincoln and they wanted to incorporate an Abraham Lincoln quote into the favors, I was inspired! The boxes were pretty simple. 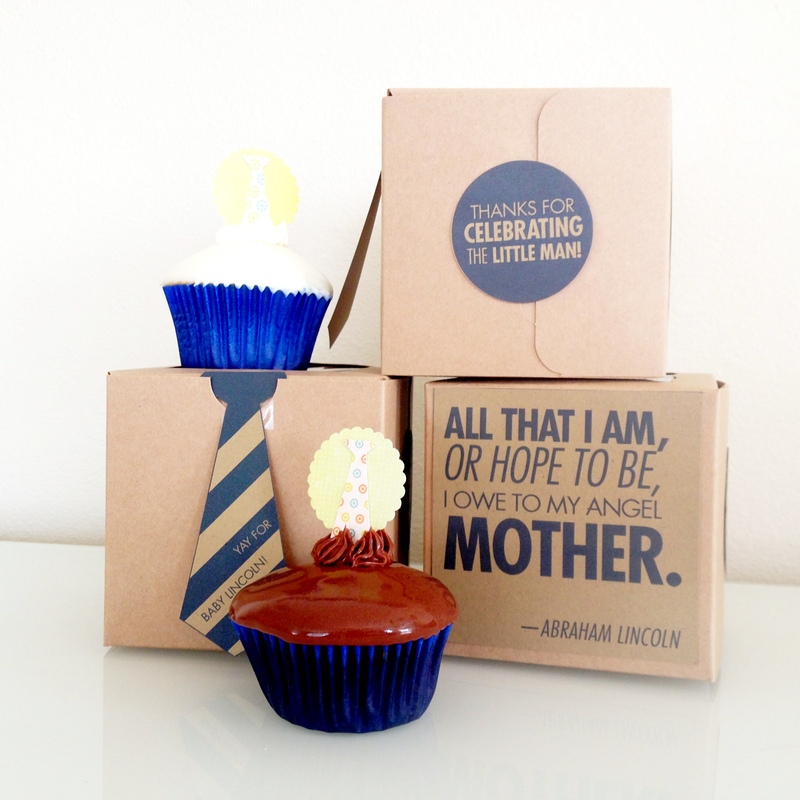 I bought individual kraft brown cupcake boxes and inserts from a local cake supply store, designed the artwork for the quote for on the back, the two circles on the sides and the tie for the front, and printed on kraft brown cardstock. 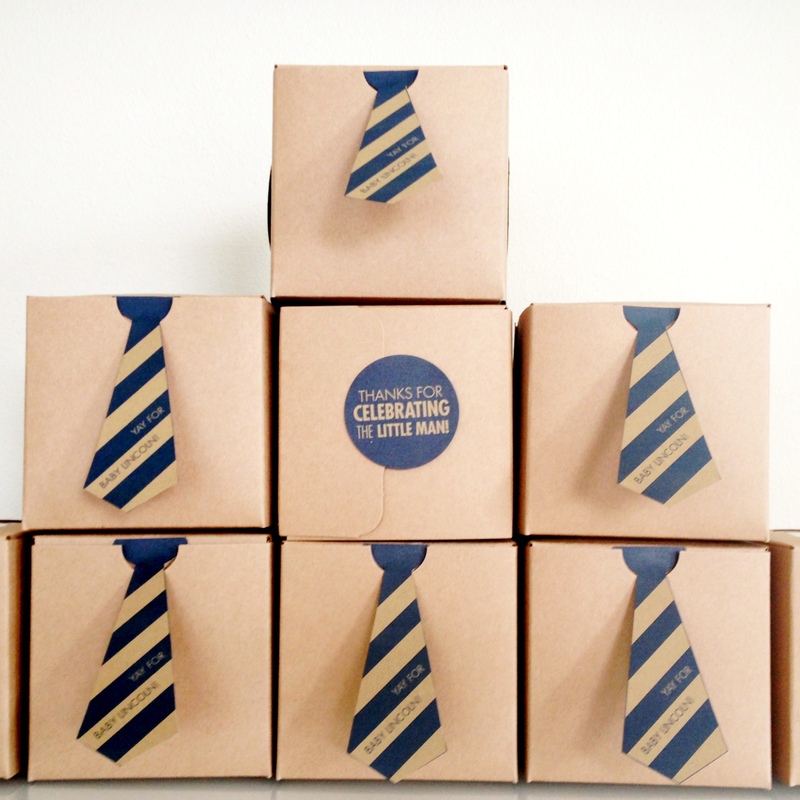 I was able to tuck the top of the tie into the closure tab of the cupcake box on the front. 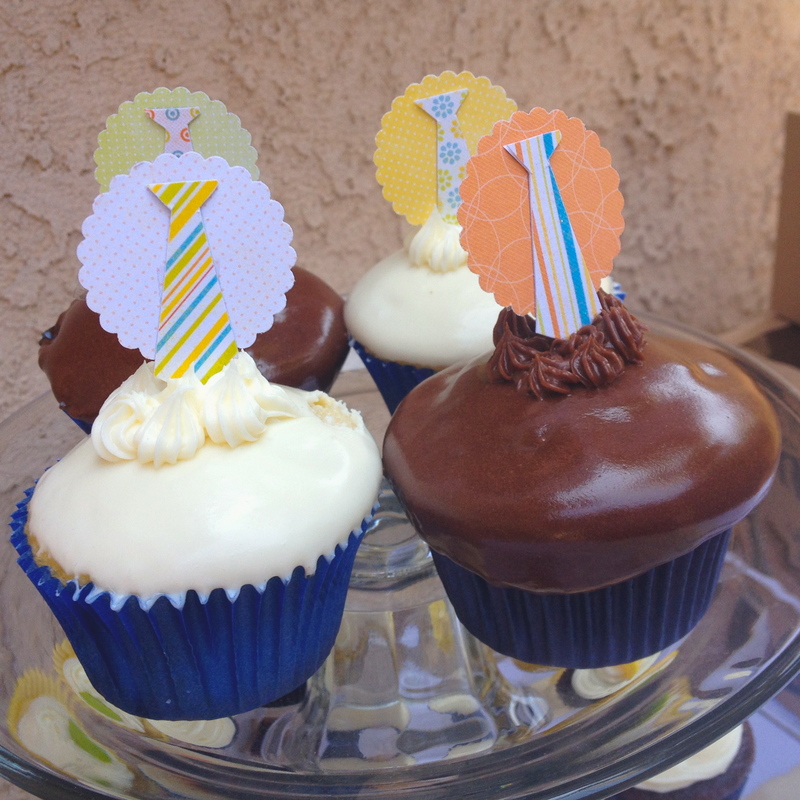 I just used the various scrapbook papers I had available for the cupcake toppers — the hosts requested blue, lime green, yellow and orange — and cut little neckties. I used my 1-in. scalloped circle punch to use as a backing and tape to a toothpick. 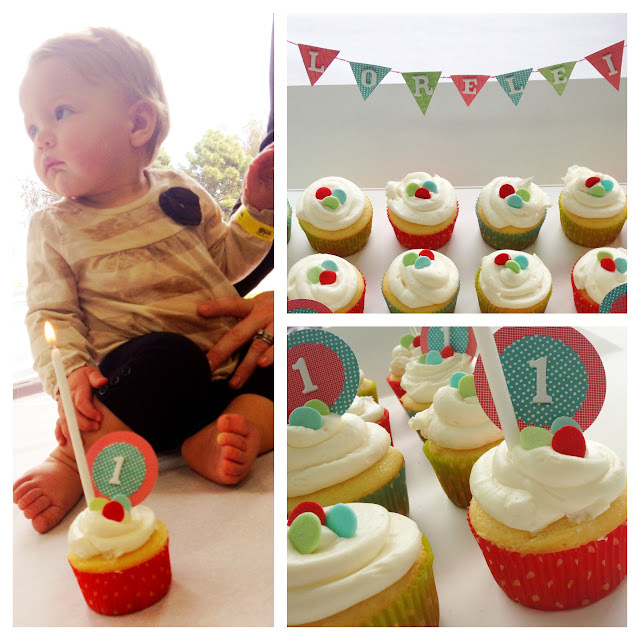 All in all, pretty simple stuff — I do love a baby party! This weekend was filled with celebrations, two of which were baby showers for second-time mommas. 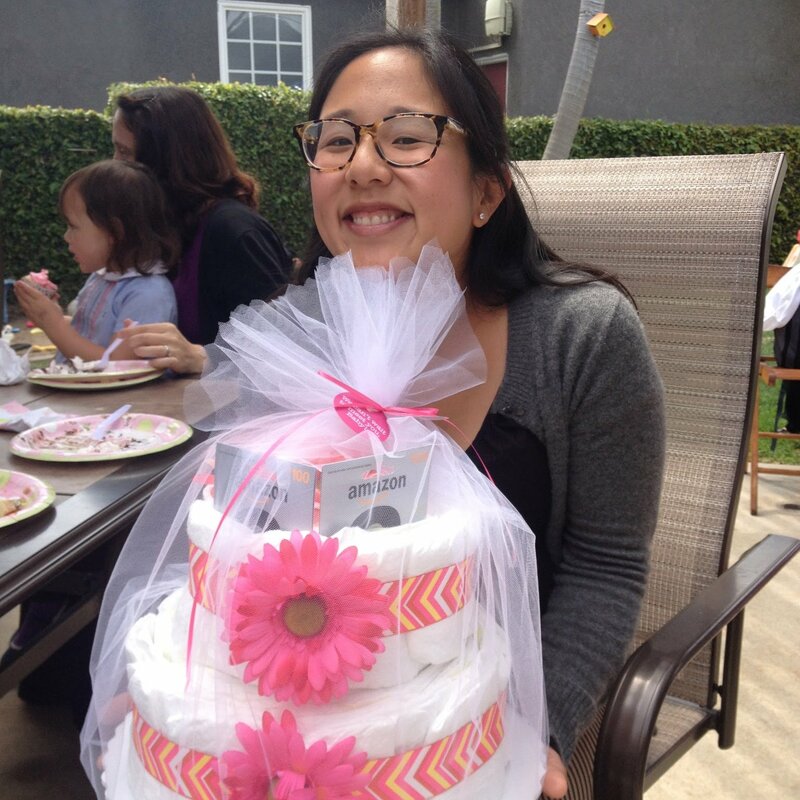 And because I’m a momma myself who appreciates practical things now more than ever, I really enjoy gifting diaper cakes. Because seriously — you always need diapers. So. Many. Diapers. 2. 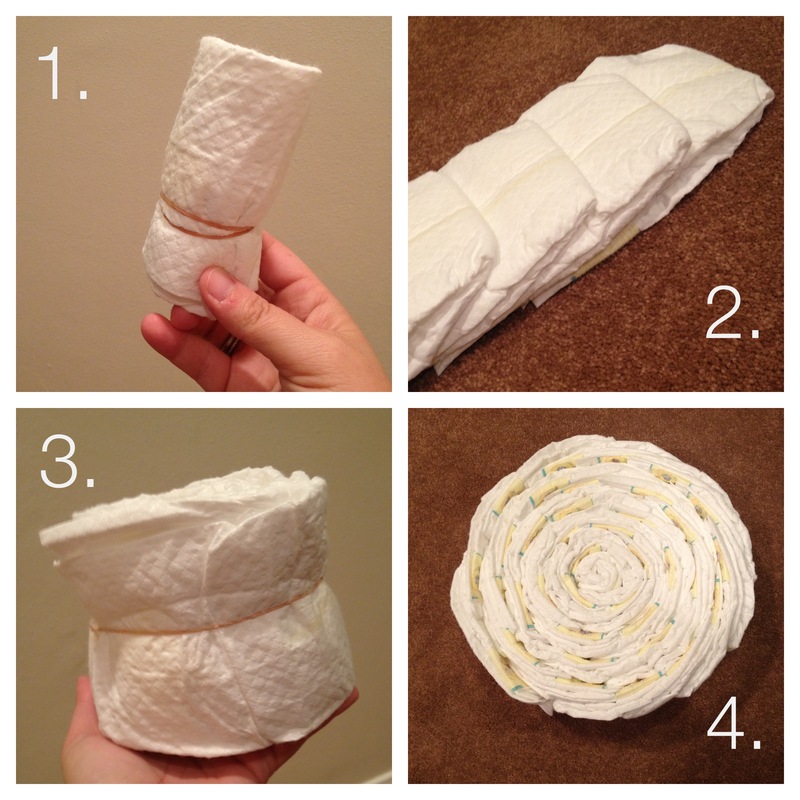 Make stacks of about 5 diapers, spaced out equally, one on top of the other. 3. Take these stacks one at a time, and fit and form around the core you created. Keep building, approx. 5 diapers at a time. Keep rubber banding after each stack or so to keep all the diapers together. 5. After the two layers of the cake reach the desired size, wrap ribbon around the center of each (you want to hide the rubber bands). Cut ribbon to appropriate length. 6. Use a paperclip to attach one end of the ribbon to the rubber band — the goal is not to damage the diapers in any way, you want all diapers to be be fully intact and useable. Attach double-sided tape to the other end of the ribbon and wrap around to close. 7. Once ribbon is centered and secured, cut the flowers off their stems, and use the stem to feed through the center of each diaper cake layer (This will keep the layers from slipping off and will secure them to each other). Cut excess stem from the top so you can’t see it. 8. Use a hot glue gun to attach flowers to the ribbon. Be sure that you don’t get glue on the diapers by gluing on the plastic backing of the artificial flower. 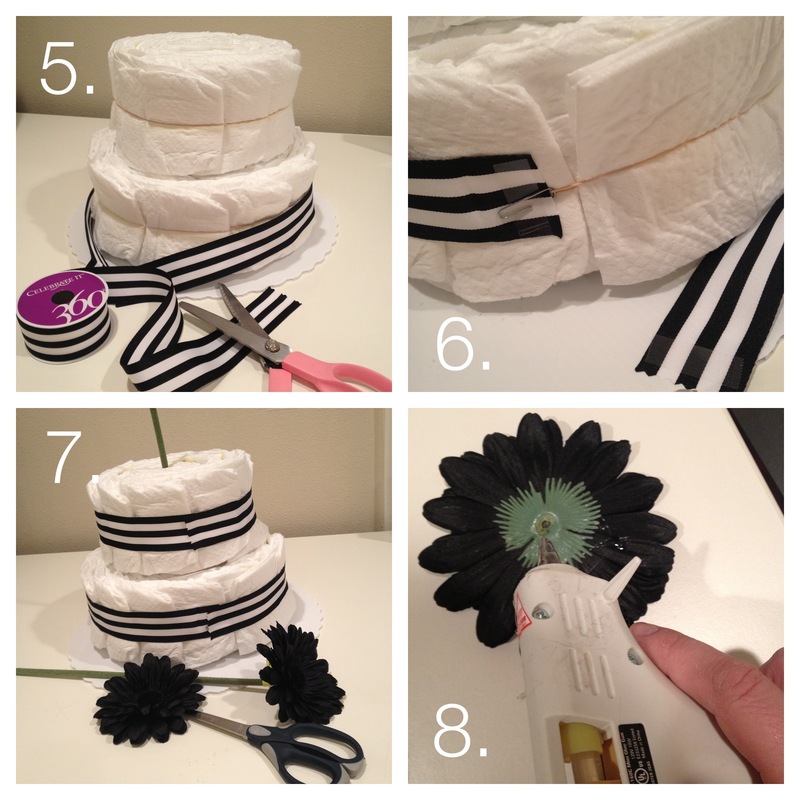 When attaching the flower, place your hand behind the ribbon to keep glue from leaking through to the diapers. Attach the flowers to cover the cut in the ribbon. 9. Once your cake is assembled, set it on the cake board and place your shoes on top. 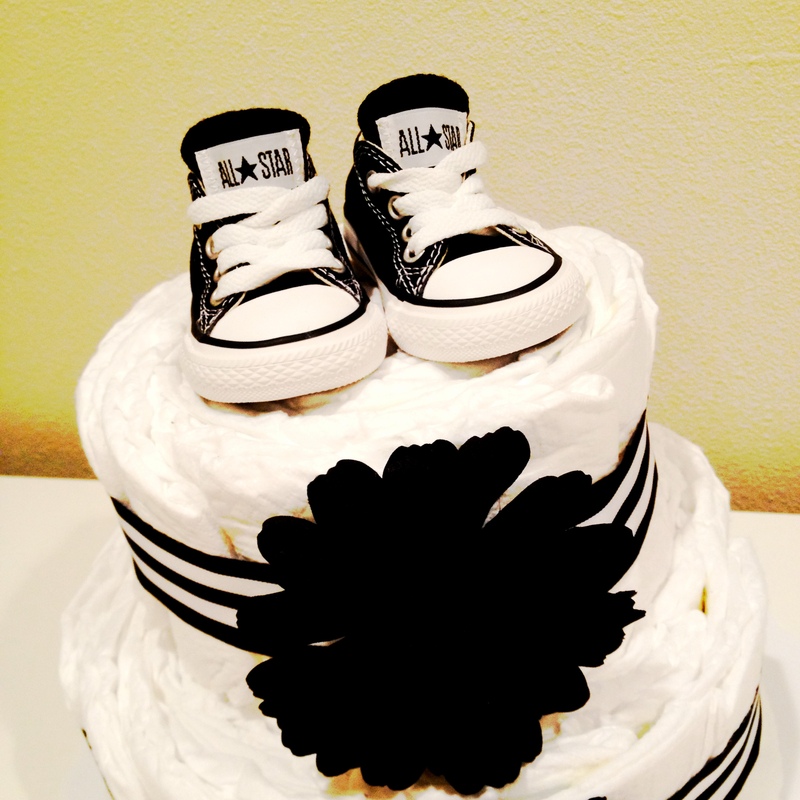 If you don’t want to use shoes, you can add more flowers, a baby toy, or whatever else you think might look cool. 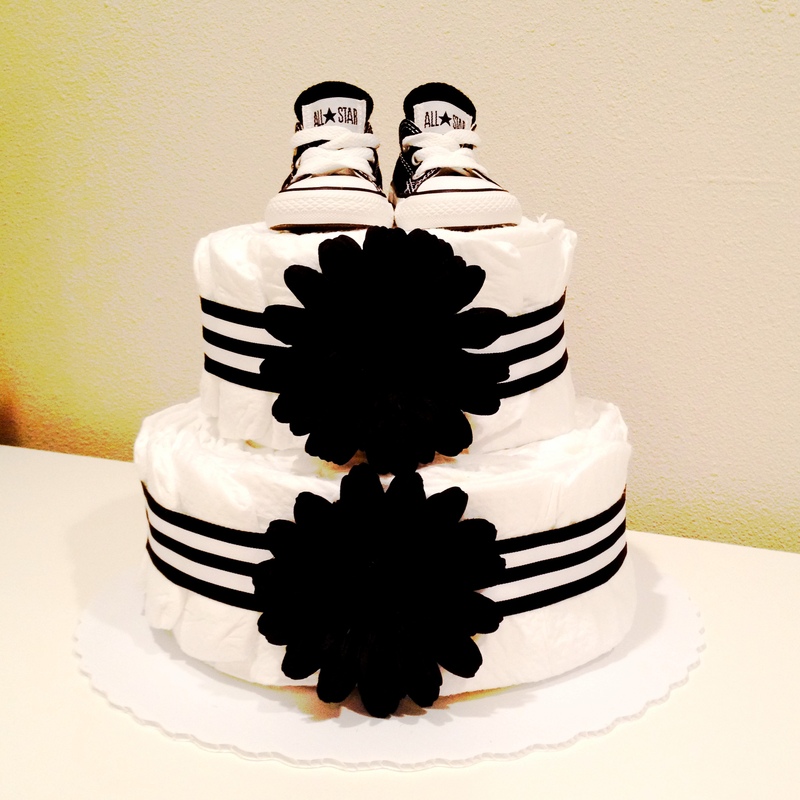 I love Chucks, and because this particular baby has a daddy who lives in his Converse, I knew this cake had to have a tiny pair! 10. 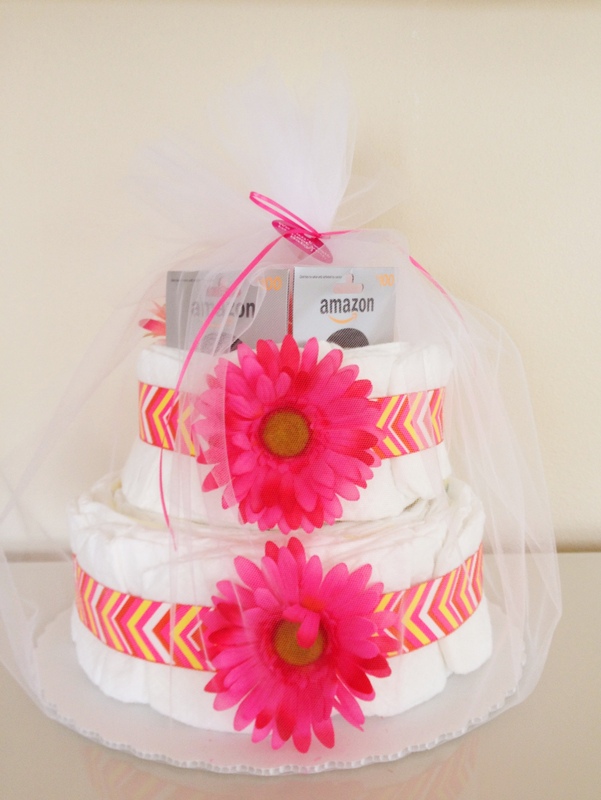 Once you’re ready to wrap, place the diaper cake on top of the tulle, and gather towards the top. Use a rubber band to secure the tulle once you’ve got it wrapped perfectly. 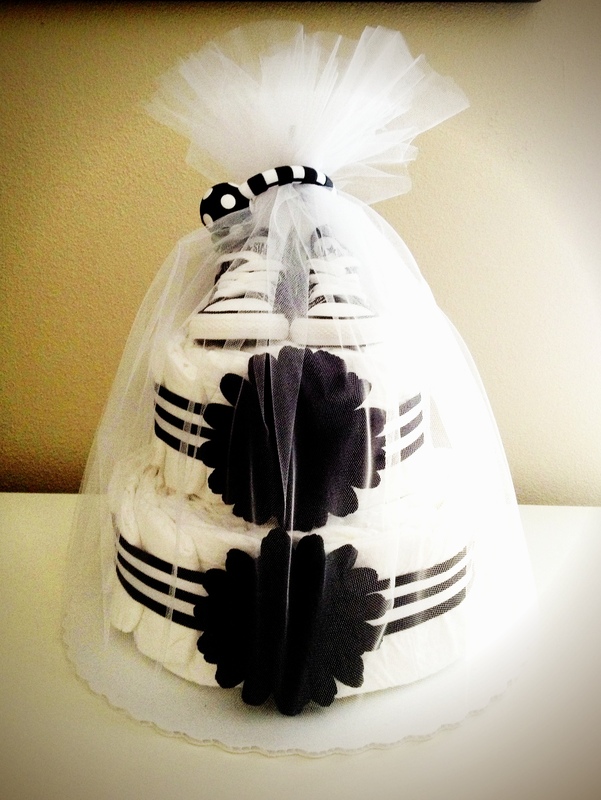 I like to cover the rubber band by tying thin ribbon at the top, and for this particular cake, I included a round rattle for the top that went perfectly with my black + white theme. The second one I made this weekend was for a baby girl — and had some moolah to go along with it! It looks so different! Today, a sweet little girl turned one, and I was lucky enough to watch her celebrate. 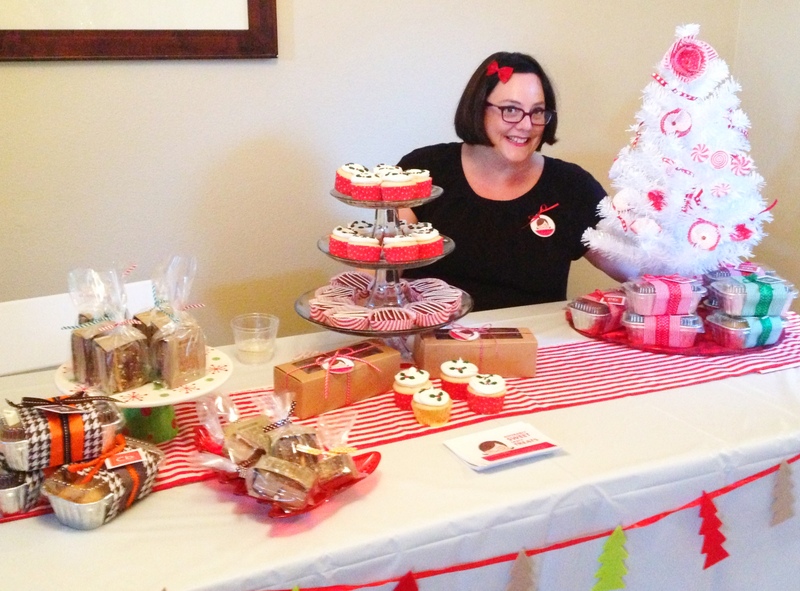 Of course, I was even happier that I got asked if I’d make the cupcakes for the event. My answer was an emphatic and anxious YES! I kept things pretty simple (it was a toddler party, after all) and went with white cake + white frosting. 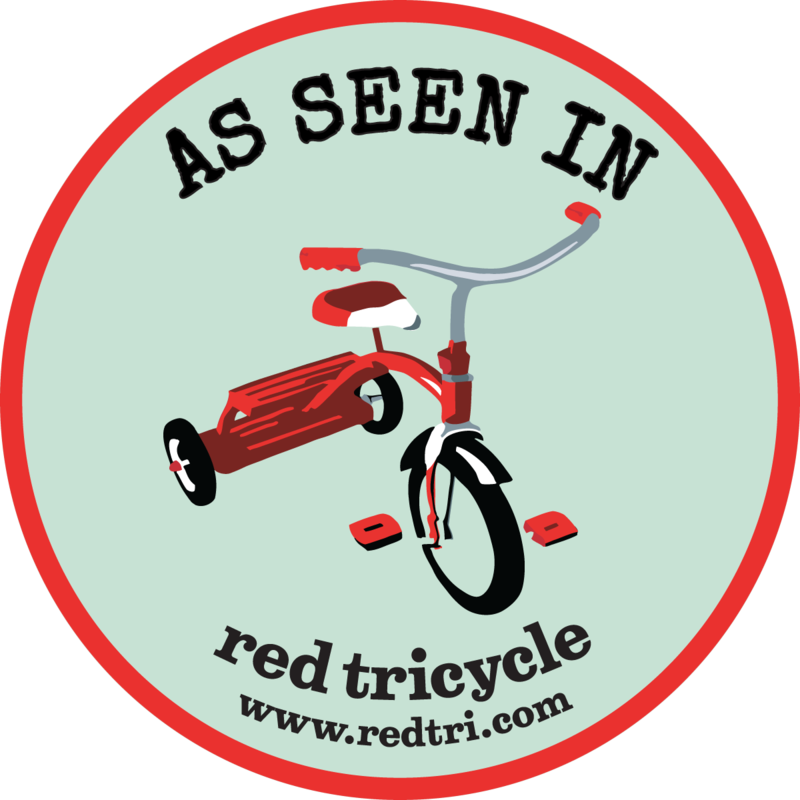 I’m kind of obsessed with the red/aqua/lime color combo as it’s bright, cheery, modern and youthful all at the same time. 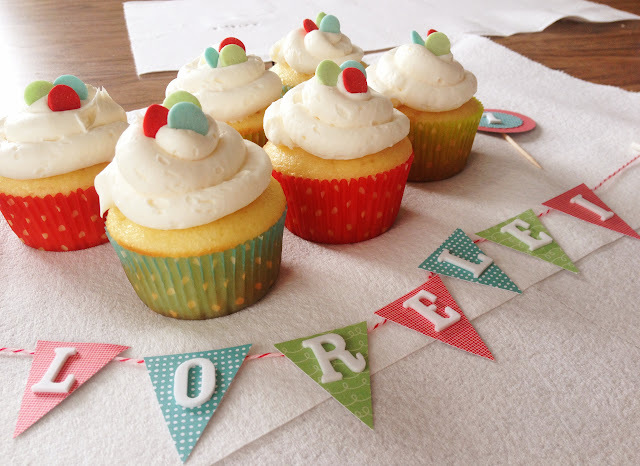 So, when I found adorable polka dotted cupcake liners these three key colors, I knew they’d be a sweet match when paired with my usual arsenal of striped and polka dotted scrapbook papers. I’ve had a friend on my mind for the last few days, and I just haven’t been real sure what to do. So this morning I finally just decided that I was going to bake some cookies. I used Bakerella’s fabulous “Cowgirl Cookies” recipe — a friend gave away a jar with all of the ingredients for these cookies at her daughter’s birthday party a while back, and the cookies were so good that I knew I’d have to make them again. They combine chocolate chips, oatmeal and M&M’s, so I figured they were bound to please just about anybody. Make no mistake, these cookies are amazing. Want to make some cookies for a friend you’re thinking about too? 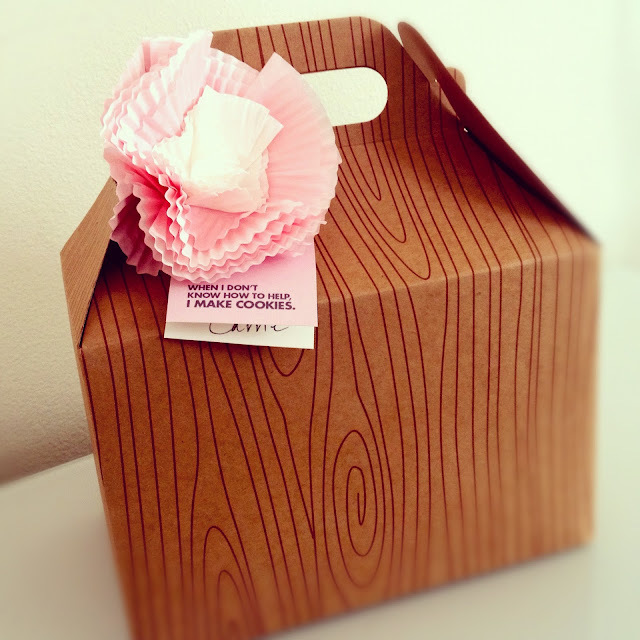 Download the free tag here and make your own box for somebody special. Well, it may not be so Autumn-esque here in California with this insane heatwave, but I decided to go ahead and make some pumpkin bread anyway! I am on a mission to find the perfect recipe for this delicious treat, as pumpkin bread truly is one of my favorites. This recipe turned out pretty well, and it’s said to be even better the next day – so it’s perfect to make for gifts. 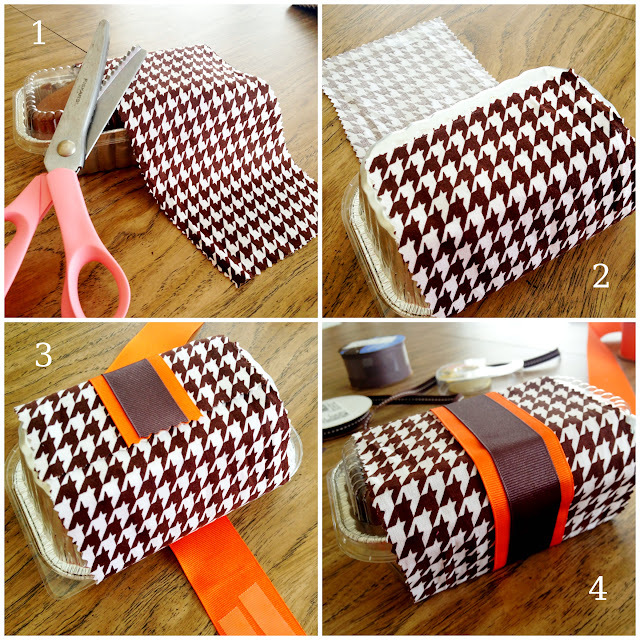 Cut your fabric in a long strip that will fit around your baking pan and lid like a belt. Turn the pan upside down and tape fabric to the bottom of the pan with double-sided tape. Make sure your “belt” is straight and wrap around the pan. Line up the unsecured side of the belt with the one you taped, and tape that side to the bottom. Cut ribbon you desire (I used two ribbons pictured above, and taped the thinner one on top of the thicker one). Tape it at the bottom, wrap around, and tape the other side to the bottom, just like with the fabric. Make sure fabric and ribbon are straight, with all taped edges on the bottom of your pan, so the top looks nice and clean. Now you’re ready to finish it off by tying on a tag or label of your choice with a thinner string/ribbon! We’re still unpacking after our move, and my printer is out of action right now, so I used a cute little tag that I’d ordered from Bake It Pretty a while ago instead of my own. 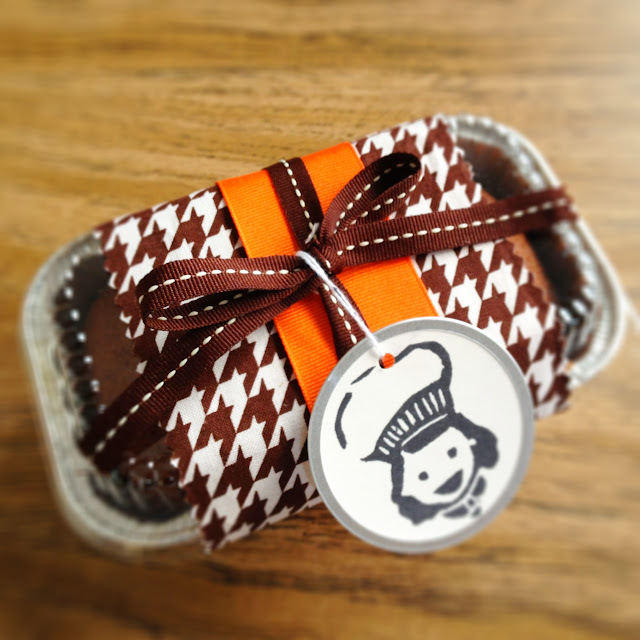 I was especially happy to find a brown houndstooth fabric to use … I feel like it’s the perfect pattern for Fall and looks great with the pumpkin bread!